I received the shower the night before I was leaving for California for a surf trip. I was sure I didn’t have any time to install it or set it up. I still had to pack not only boards but find my wetsuit and do laundry. I unboxed it anyways and grabbed the one page instructions and small bag of hardware. I glanced at the instructions and the install was one paragraph long. I looked at the hardware and there were only 4 bolts. I thought damn, this would be nice to have on the trip and a perfect opportunity to test it. Just as it was getting dark I began the install and before the sun had even set I had the thing mounted and filled. It literally took 10 mins and I had water flowing already. The shower is made out of aluminum and powder coated black for solar heating of the water. All the welds and fittings are solid. The paint seems durable and the hose nozzle is quality right out of the box. It is 56.5” long and there is a T-slot along the bottom to slide the 4 bolts into. I placed it on my racks on the passenger side so the hose would have the most slack at the tailgate of my truck. 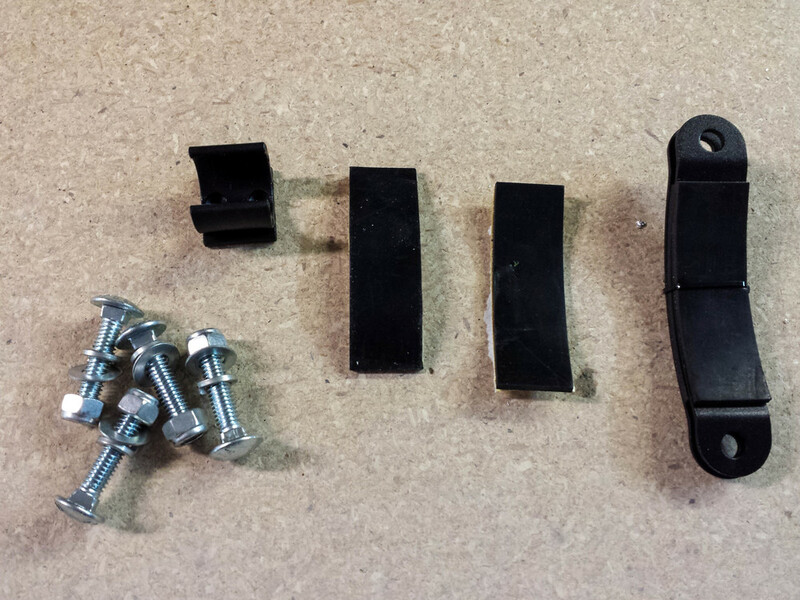 I tightened down with the supplied nylon nuts and plates and checked to see if there was any movement. Pretty easy and quick install! Now to fill it up. The radiator style cap on the fill end is easy to screw on and off and is designed to release at 18 psi. I had pumped as much as 20 psi into it at one point and it never released which is good because the pressure lasts longer. It holds 5 gallons of water which was plenty for changing out of wetsuits for about 5 surf sessions with 2 or 3 people using each session. It weighs in at 15 lbs dry and I didn’t notice any effect on MPG or wind noise on our 1400 mile trip. After filling it for the first time I immediately reached for the nozzle to test the gravity fed pressure. Just a trickle but this would be fine for filling water bottles or cleaning camp dishes. No time for getting the bike pump out tonight, I waited for California to try the pressurized shower out. On the drive I never bothered with the velcro tie downs for the hose. The slip in hose holders seemed strong enough but the 80 mph speed limit in Southern Utah was quick to rip the nozzle out and let it dangle full length. It never reached the road though. Arriving in Ventura we went straight to C-Street to paddle out on some new boards. Surfed fairly clean, stomach high rights all evening. We pumped the shower up while planning the morning dawn patrol at Oxnard. The next morning after surfing for several hours we used the pressurized shower. It was nice to spray fresh water over the boards and shower the wetsuits off with. There was just enough pressure left to rinse our feet off also before sliding the flops back on. The water had warmed too, even though the marine layer had only just started to move out about 45 mins before we got out. With ~15 psi in the shower, good pressure lasted about a minute with a small bit of pressure for another 30 seconds. The next time we use the Roadshower I will bring a pump or a CO2 device to charge the shower on demand! On the drive home we used the Roadshower to refill water bottles, wash hands and cool off while eating lunch in Las Vegas. With the exception of having to refill with air after a minute or so I am super happy with this piece of gear. The uses for this thing are endless and it is perfectly suited for surfers! Regarding the Road Shower, the way I do it, is run it off gravity for a gallon or so. You need to loosen the cap or the water won't flow. Once you have about 4 gallons, you can pump it up and it will last longer than 1 minute. Once down to 3 gallons, you can pump it up and it will last until the water runs out. It is just the way it is. But once learned can be adapted to.